Many many years ago in the late 80’s, when I lived in Atlanta, I entered an amateur recipe contest, US Open Cook-Off. 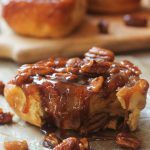 I submitted several recipes, but it was my Apple Cinnamon Sticky Buns that won me the entry into the bread division competition. On the day of the competition, my parents drove up from my home town of Augusta, for support. When the judges approached my table, I tried to read their faces for a clues, but nothing, and then the waiting for the announcement of the winners. We waited and waited and waited, finally I decided to go grab a bit to eat with my parents, there was no way I would win. 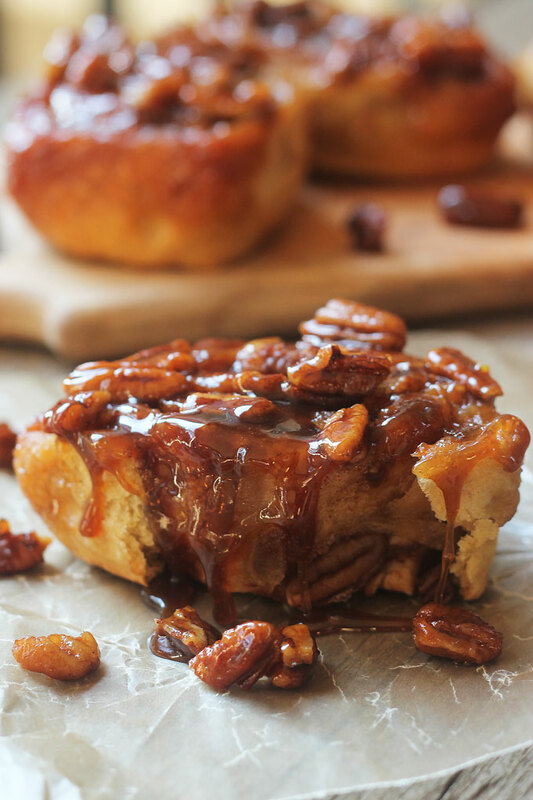 I left something inside, went back to get it and, what do ya know, my name was being called for third place winner, WOW, so this is my award-winning Sticky Bun recipe. Over the years I’ve only made this bread once or twice since then. When my daughter found out about this, she insisted I make it again, so here it is my Award Winning Apple Cinnamon Sticky Buns. This will turn into yummy goodness. See that empty spot, someone couldn’t wait for the invert. A lot has changed over the years, one of them being my eating habits, so I made a few changes to the original recipe. I omitted the eggs, Earth Balance replaced butter, coconut sugar for white sugar and I added whole wheat pasty flour for softness. Still an amazingly delicious bread. That’s some sticky goodness! Get your napkins ready. 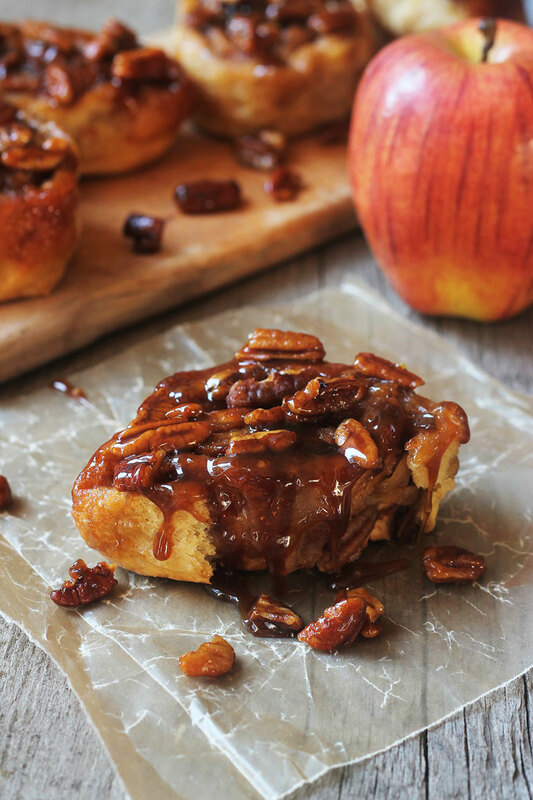 Sweet juicy apple tossed in cinnamon, brown sugar, rolled up in soft tender bread. It’s like eating a cinnamon apple pie. Pour almond milk into large measuring cup, add earth balance and heat in microwave for about 45 seconds or until everything is warn and melted. Mixture should be warn, not hot, if too hot it will kill the yeast. Sprinkle on yeast set aside and allow to proof at least 10 minutes. In a large mixing bowl whisk together flour, salt and sugar. Create a well in the middle of flour and pour in yeast mixture. Mix flour and milk together, when dough comes together, transfer to lightly floured surface and knead for 2 to 3 minutes. Sprinkling on flour as needed to keep dough from sticking to surface or your fingers, you should have a soft springy ball. Place ball into a greased bowl, cover with towel or plastic wrap and allow to rise for one hour in warm place. While dough is rising mix together 3/4 cup of brown sugar and 1 stick of room temperature Earth Balance Vegan butter and spread on bottom of 9×13 pan, set aside. Peel apples and slice into thin strips or shred in food processor, mix together in medium bowl with 2 teaspoons of cinnamon, cover and set aside. When dough is ready roll it out on a lightly floured parchment paper into a large rectangle about 1/4 inch thick. Spread on 2 tablespoons Earth Balance Vegan butter, top with brown sugar and apples and pecans. Carefully roll from the longest end using parchment paper to help keep roll tight. With seam side down, carefully cut into 2 inch slices and place in pan. Melt remaining Earth Balance and brush on rolls. Cover and allow to rise again for about 1 hour, during last 15 minutes of rising, preheat oven to 350 degrees. Bake for 25 to 30 minutes or until top is golden brown. Allow to cool slightly, invert, serve and enjoy! piqued my interest in utilizing butter alternatives as well as sugar alternatives! Thanks for all the delicious ideas! I’m glad, you have to let me know how it works for you. These are quite possibly the most delicious thing I’ve seen in awhile. I am drooling. Why, thank you! They are quite delicious. G’day! Looks great and great photos! Thanks for sharing at our #SayGdayParty! Thanks, I’m sure I’ll check out many before days end. Thanks for hosting. Oh My Gosh!!!!!!! That is a mega Drool running down my chin! Yum! Thank you and thanks for stopping by Cathy. Award winning! I’m sure they are even better now that you have lightened them up! Or at least I would feel quite so guilty when I couldn’t stop at just one! Pinned! It is hard to stop at one or two. Thank you, I’m glad you are enjoying. 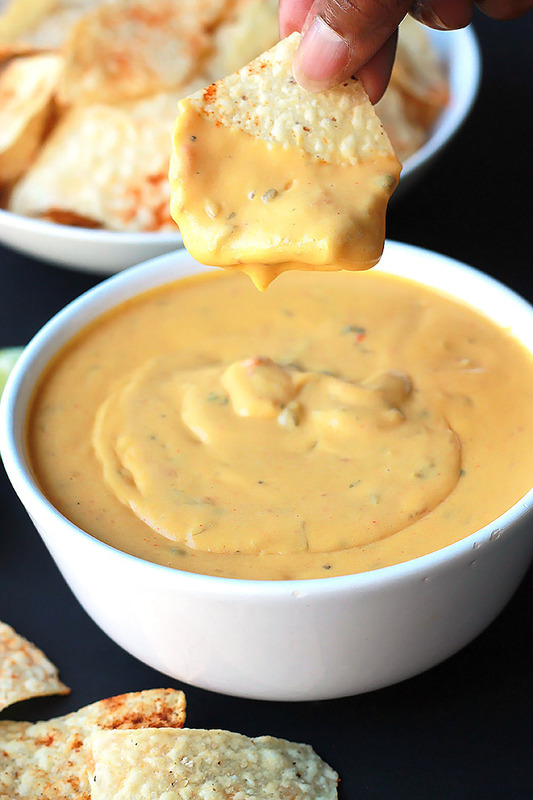 These are simply mouth-watering. I just had to feature them at Saturday Night Fever this week! 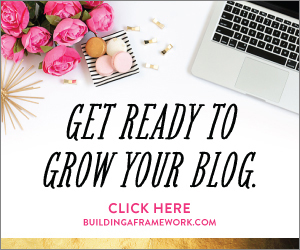 Thanks for linking up with us, too! Thank you so very much for the feature, and I’m glad you like them. Hello! These look delicious, can’t wait to try them! Just a question… what’s “bread flour”? is it different to regular flour? I’m not sure how could I find it in spanish, under what name… any ideas? Bread flour is strong and has a higher gluten content, and it’s good to use when making bread product, but you can easily use all-purpose. There is a Spanish brand called Lidi’s, but it may make a heaver bread, I suggest using plain all-purpose flour. Please let me know how the recipe works for you. 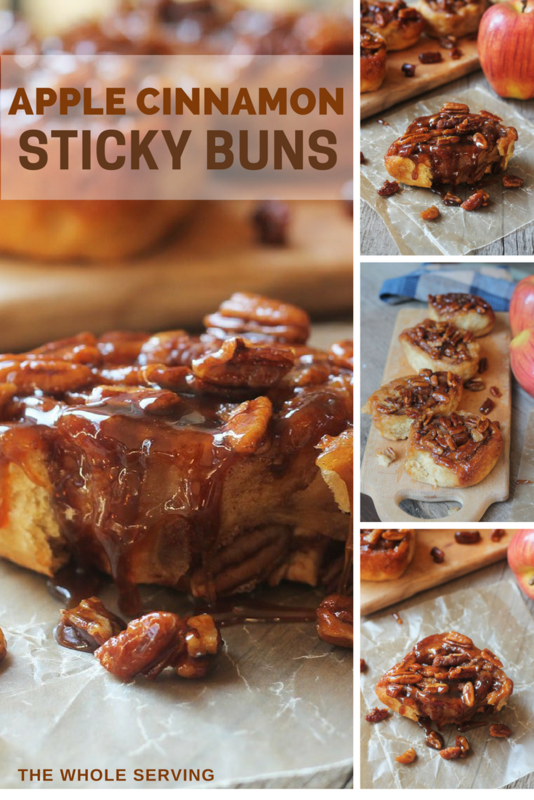 WOW, those are some seriously show-stopping sticky buns!! They look sinfully scrumptious 🙂 Can’t wait to give them a try! Thanks April, they are sinfully delicious, and thanks so much for visiting. I’m glad it brings back good memories. If you give this a try, let me know what you think. WHY do you have to post stuff like this??!!! I’m trying to go on a diet and those are the yummiest looking things I have seen in a long time. Yeah, but sometimes we just have to treat ourselves. When I eat one it’s on my workout days,it will burn it all off. These are sooo good! Followed the recipe exactly but I used real butter and all purpose instead of bread flour. They turned out perfect! In fact I now use this dough for many of my favorite recipes, such as my grandmas streusel kuchen (crumb cake) and plum cake. 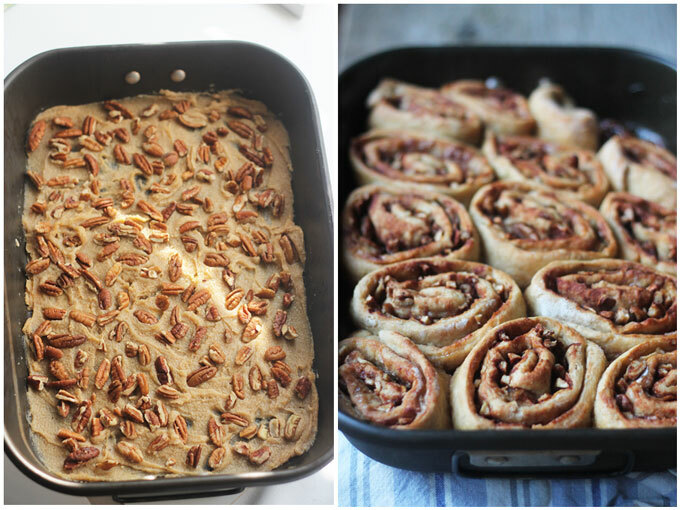 Her dough recipe is great but this is great and healthier. Win-win situation. Thanks so much for the recipe! Thanks Sarah for letting me know, it’s always nice to know when readers try and like the recipes I share. By the way next week I’ll be sharing a similar recipe that uses wild blueberries. So much deliciousness. I would have given you first prize. I think I can smell the yummyness from here. 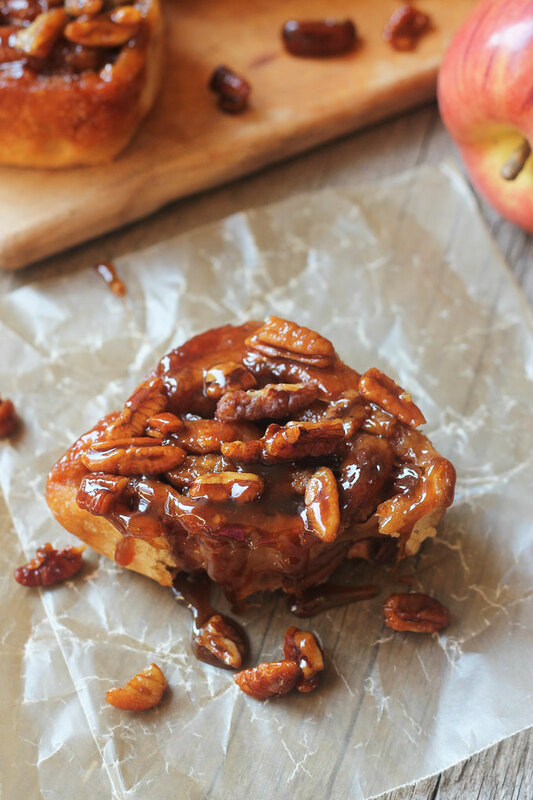 These apple cinnamon sticky buns look amazing! So gooey sticky and yummy! They are delicious and I like making them during the fall of the year when we entertain more. 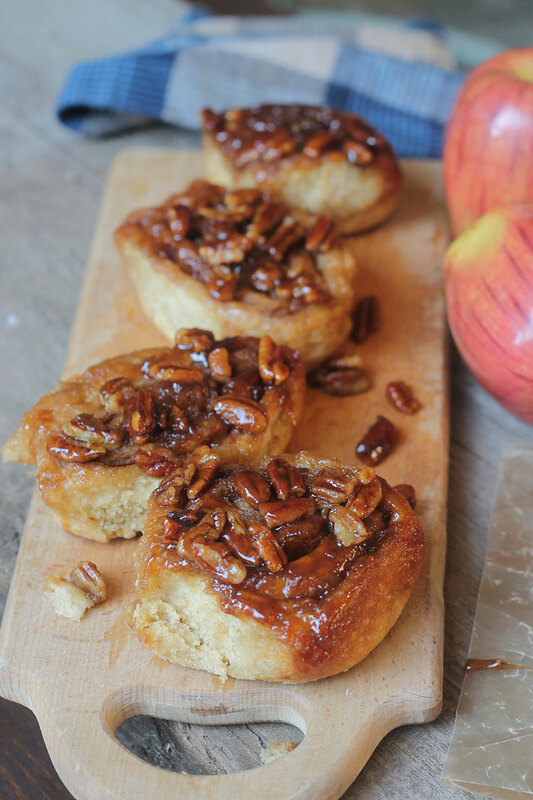 Thanks for featuring my recipe for Apple Cinnamon Sticky Buns. I love this. Can’t wait to make it. Can I use regular all purpose flour and can I use regular whole wheat flour instead of pastry flour? Using regular all-purpose flour will be just fine, let me know how it goes.